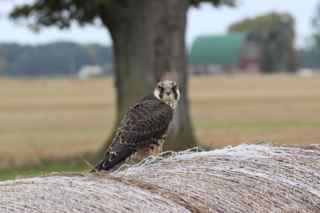 I noticed this bird of prey on our hay bales - I got as close as I could and using my zoom lens snapped these shots. If someone knows what this is I would love to know for sure. Thank you for sending your report and pictures - I'm sure one of our readers will be able to identify your mystery bird! Comments for Juvenile Hawk or Falcon? This is a female Kestrel. That is a Merlin. Definitely not a Red Tail. 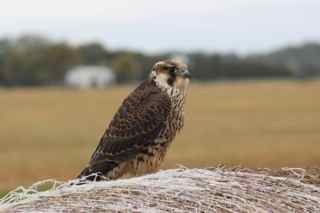 I myself thought it had to be a type of falcon because of the facial stripes. In my area I think it could only be a juvenile peregrine falcon. I'm new to birding and love spotting birds of prey. As for the identification of this bird, judging by the prominent vertical bands descending from the eyes, it seems to be a species of falcon. This is definitely a Red Tailed Hawk, you can tell by the breast color and the feathers. I see them fly by my balcony quite a bit chasing and catching the pigeons and sometimes the Seagulls.